WASHINGTON, March 21 (CGTN) -- U.S. President Donald Trump said on Thursday the United States should acknowledge Israeli sovereignty over the hotly-contested Golan Heights, in what amounted to a major pre-election gift for his ally Israeli Prime Minister Benjamin Netanyahu. Trump called the Golan Heights "of critical strategic and security importance to the State of Israel and Regional Stability!" About 20,000 Israeli settlers live in the Golan Heights, which overlooks Syrian territory. "At a time when Iran seeks to use Syria as a platform to destroy Israel, President Trump boldly recognizes Israeli sovereignty over the Golan Heights," the prime minister wrote on Twitter. "Thank you President Trump!" There was also quick approval from the senior Republican in the U.S. Senate, Lindsey Graham, who is pushing for Congress to recognize Israeli control over the Golan Heights. 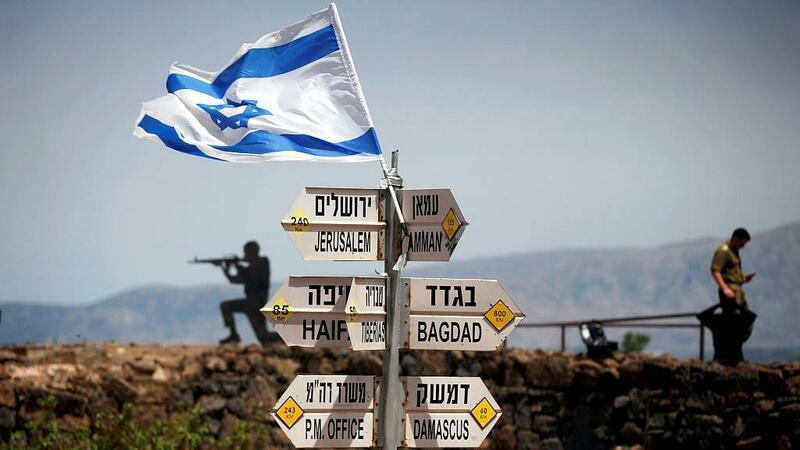 The drastic policy change has met criticism from residents in the Golan Heights. In a phone interview with Reuters, Ayman Abu Jabal, a member of the Druze community in the Israeli-occupied Golan Heights said, "Neither America nor Israel, neither Trump nor Netanyahu, will change the historical fact that the Golan lands are Syrian lands and they will remain Syrian lands." The announcement has been criticized within the U.S. as well. Leon Panetta, a veteran Democrat who served as CIA director and defense secretary, among other roles, also blasted Trump for "tweeting out another policy that obviously has not been worked out with our international partners." J Street, a liberal Jewish-American lobbying group, criticized Trump's action, saying that premature U.S. recognition of Israeli sovereignty of Golan Heights is a needlessly provocative move that violates international law.